A wounded British photographer who had been trapped in the besieged Syrian city of Homs has been spirited safely into Lebanon in a risky journey that killed 13 rebels who helped him escape the relentless shelling and gunfire. 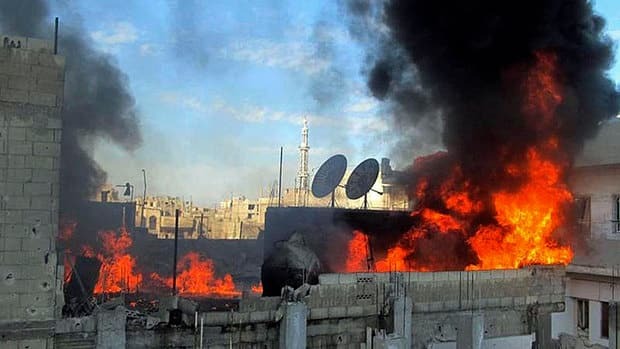 The United Nations said the death toll in the 11-month uprising against authoritarian President Bashar Assad was well over 7,500, and activists reported more than 250 dead in the past two days alone _ mostly from government shelling in Homs and Hama province. Tunisia’s president _ the first since the country’s own Arab Spring uprising toppled his predecessor _ offered the Syrian leader asylum as part of a negotiated peace, an offer Assad will almost surely refuse. The harrowing ordeal of British photographer Paul Conroy, who was wounded with a French colleague last week by government rockets that killed two others, has drawn focus to the siege of Homs, which has emerged as the center of the anti-Assad uprising. Hundreds have been killed in the city, parts of which the army has surrounded and shelled daily for more than three weeks. Many have died while venturing outside to forage for food, and activists have posted videos online of homes reduced to rubble and alleyways rendered no-go zones by snipers. Conroy’s escape was the first sign of relief for a group of Western journalists who sneaked into Syria illegally and reached the embattled Homs neighborhood of Baba Amr only to find themselves trapped. Government rockets bombarded the makeshift media center they shared with activists last week, killing two of them and injuring Conroy and French reporter Edith Bouvier. Conroy and Bouvier later appeared in activist videos lying on makeshift hospital beds, pleading for help. Conroy crossed the border into neighboring Lebanon after leaving Homs on Sunday evening, according to the global activist group Avaaz, which said it organized the evacuation with local activists. The group said 35 Syrians volunteered to help get the journalists out and 13 were killed in the operation.